Tapioca Pudding is a sweet milk based dessert with a creamy texture and flavor. With the right recipe, this pudding is delicious and looks so enticing when served in pretty bowls with a nice dollop of whipped cream and a few chopped pistachio nuts sprinkled on top. Now, what type of tapioca do we use to make tapioca pudding? Tapioca (pronounced tap-ee-oh-kah) comes from the root of the starchy cassava plant, also called manioc or tapioca plant, which grows in tropical regions of the world. There are two forms of tapioca that can be used to make tapioca pudding, either the tiny-grained quick-cooking tapioca (also called minute or instant tapioca) or the pellet tapioca (more commonly known as pearl or bead tapioca) which comes in small and large sizes. I prefer the quick-cooking tapioca (used in this recipe) for a few reasons; I like its texture, it doesn't need to be soaked, and it's a lot easier to find (it is carried in every grocery store whereas the pearl tapioca is mainly found in specialty stores). Quick-cooking tapioca is tapioca that has been pre-cooked (think of par-boiled rice) and dehydrated so the tiny pellets don't need much soaking, they only need to be moistened and heated in order for the tiny pellets to swell and become opaque in color. Tapioca has the advantage of a long shelf life. It can be stored in a cool, dry, dark place for 2 - 3 years. To produce a creamy flavored tapioca pudding I like to use a combination of heavy (whipping) cream and whole (full fat) milk. I find if you use low fat milk, the pudding will have a watery texture with little flavor. To make tapioca pudding you first mix the ingredients together and let it sit for about 10 minutes to moisten the tapioca. Then all you need to do is place the saucepan over medium heat and bring it to a boil. To prevent scorching stir the pudding constantly but slowly. When the pudding comes to a full boil, remove from heat and stir in the pure vanilla extract. The pudding is left to cool for a bit and you will then notice how the tapioca has started to swell and become opaque in color. Now the pudding may seem quite thin and you may wonder if there should have been more tapioca used. Do not worry, you have used enough tapioca because I find if you use any more, the texture of the pudding is too thick and jelly-like. So be patient because as the pudding chills (about four hours, or even overnight) it will continue to thicken. There are a few ways to serve tapioca pudding. You could serve it plain with no garnish. Or, like me, you can enjoy your tapioca pudding with a dollop of whipped cream and maybe a sprinkling of nuts. Others prefer their pudding with a dollop of jam or a fruit sauce, such as raspberry, strawberry, or red currant. No matter the way, this pudding is sure to please. Tapioca Pudding Recipe: In a medium sized, heavy bottomed saucepan combine the milk, cream, salt, sugar, tapioca, and beaten egg. Let sit for about 5-10 minutes. Place the saucepan over medium heat and, stirring slowly but constantly, bring to a full boil (this will take about 10-15 minutes). Remove from heat and stir in the vanilla extract. Let the pudding cool, untouched, in the saucepan for about 20 minutes. (The pudding will still be a little thin after this time.) Stir the pudding and then pour it into your serving cups or bowls. Cover with plastic wrap and place in the refrigerator to chill for several hours, or even overnight. 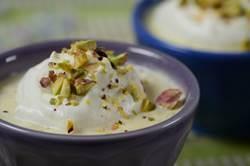 If desired, garnish with lightly sweetened whipped cream and chopped nuts. Can also serve with fruit sauces or jams. Makes 4 - 6 servings. Preparation time 40 minutes.